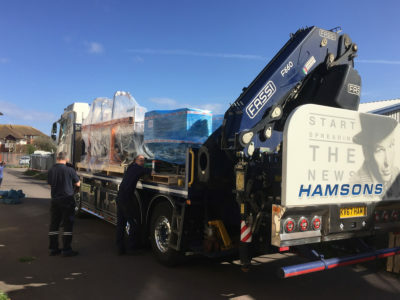 With a huge ‘thank you’ to Hamsoms Haulage and Cutting Systems UK, we are happy to announce the arrival of our latest Flash-cutter o the Minehead factory. The machine is a state-of-the-art computer controlled cutting machine that will help us increase production across all our core items – from belts and holsters to tactical vests. As we run through the first days’ set up and testing we will post further images on our Twitter, Facebook and LinkedIn feeds.